Hello, friends. 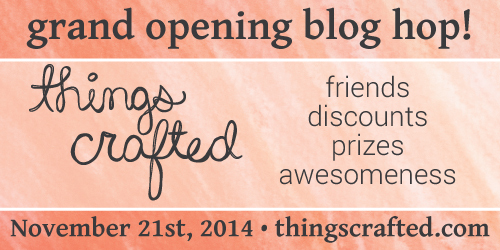 I'm so excited to be taking part in the grand opening blog hop for Things Crafted! You should be arriving here from the blog of the talented Chari Moss. 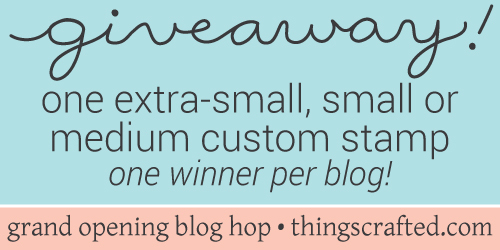 If you're just joining us on the blog hop, you can head over here to the ThingsCrafted blog to start from the beginning! A little background on ThingsCrafted: ThingsCrafted is a place where handmade design and customization come together to create a wonderful company who creates and encourages color, personality and community. ThingsCrafted was founded by Britta Swiderski, a designer with a background in the world of papercrafting and a history of working with awesome graphic design clients. ThingsCrafted provides custom products - starting with stamps - to suit your lifestyle all starting with handwritten designs. They all go from pencil to computer to your doorstep! We love to create stamps and designs for addresses, "made by"s for the projects you send to others, favorite phrases or shapes for project life and planner organization and so much more. I chose the small square stamp and i asked Britta to work her magic on it. I wanted Handmade By Mary Dawn and I chose the script style. I love how looks on the backs of my cards. ThingsCrafted also offers some pre-designed stamps for those that want to try something new and handmade but don't have a particular need for a custom stamp. I received the large happy stamp to play with. It's the perfect size to be the focal point of your card. And it looks fantastic when heat embossed, just sayin'. Thank you for stopping by today. Before you go - make sure to leave a comment on this post and each one along the hop to enter to win a custom stamp! One will be given away at each stop along the hop. We'll be getting in touch with you via email, so make sure you add your email to your comment! We'll be drawing winners on Tuesday, the 25th of November, so be sure to leave a comment by then. There's also a special treat for everyone in the blog hop - 15% off your order until Tuesday, November 25th using the code GRAND15OFF as part of the Grand Opening event! 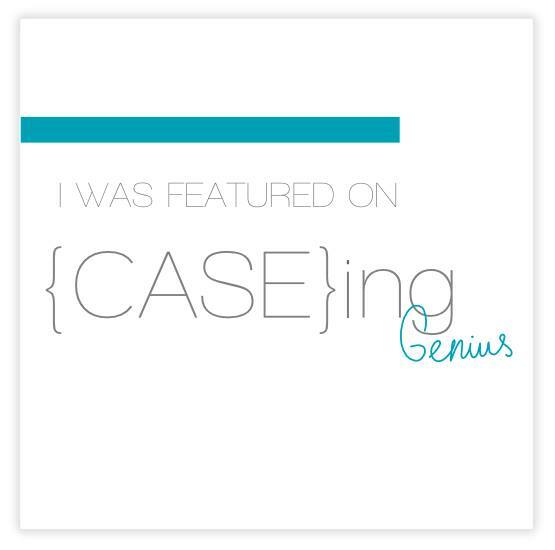 The next stop on the ThingsCrafted blog hop is the mastermind behind Things Crafted, herself, Britta Swiderski! Happy hopping! Your card is so adorable, and I love the idea of being able to REALLY personalize this card with your name. Great job. I really like the "happy" stamp. That would look great as a focal point. And I see me getting a custom stamp soon for the back of my cards. Gotta love those quirky fonts! Love your happy card too! So so cute! I love the personalized stamp...I need one of those! The card is fabulous! And I am loving these custom stamps! Love these custom stamps...fun gift idea! Love the stamps from this company! Sweet card. Love the style of the greeting. Those hearts look great on Kraft. BEAUTIFUL CREATION!!! I DO LOVE how that custom stamp has that handle!!!! :D It just HELPS with stamping!!!! Custom stamps rock!!! Your card is lovely. Great showcasing of the new stamps . . . thanks for sharing. Great stamps! Thanks for the opportunity to win! Love the idea of designing your own stamp. Thanks for the chance to win. Cute card! That "happy" stamp can be very versatile! Super cute. Love the idea of using a stamp on the back of my card especially color coordinating. Great combination of colors with awesome stamps! Great stamp! Love the font--and also like your cute card. 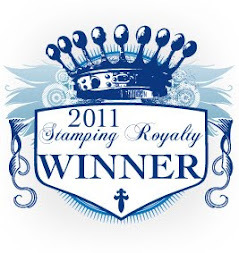 Love your custom stamp and how you played with the 'Happy' stamp, Mary Dawn! Got to have that happy stamp as well. Thanks for sharing the pretty card! Britta rocks with her custom stamps! Happy is the word of the day! Love this stamp! I can think of several stamps I would love to have created! Adorable stamps and such a cute card you designed! Love the card and the use of glitter paper. Super cute. Love the card. Really showcases the happy sentiment well. The "happy" stamp is so versatile. I could see that on so many different cards. Thanks for the chance to win such a great prize! It is so... so you! Of course, I dig it! The large happy stamps is very versatile. Thanks for sharing. Lovely card! Those customized stamps are so versatile,would love to win this giveaway!! Love your stamp and your card design! Very pretty, the happy stamp is so cool! Such a cute and sweet card! And I love the font of your custom stamp, so pretty! What a gorgeous card and an awesome custom stamp! Love Your card and stamp. Love what I've been seeing so far. Would love to have a stamp to stamp the back of my card. Your choice of this great stamping option is adorable! Love 'em! I love these stamps more and more each time I look at them! Lovely card. I just love the font on you're handmade by stamp. Great to have a place to be able to order you're own stamps. I love your card. The colours and layout are amazing. And your custom handmade by stamp is really neat! I like this colour combination and I really love CAS cards! It would be awesome to win a personalised stamp, thank you for the chance! Great card and great stamps. Thanks for the chance to win. Great card. Love the sparkly heart. Love the Happy stamp! I can see so many uses for that one. Such a sweet card and custom stamp! That 'Happy' stamp is really quite nice. I'm beginning to think I should have it! LOL Great card. What a great card. I like the color combo that you used on your card. Both of your stamps are great! love the combination of fonts. I really like these special stamps. Thanks for sharing with us. Awe.. that card makes my heart happy.. and I love the personalization of the options... so so many options. beautiful kraft card!!! the colors are so pretty! Hey Mary! Your card is so cute, OMG. I love it. I wasn't sure about the happy stamp but when I saw in on your card. Its needed now. Nicely done. Love this bigger stamp! Thanks for sharing. Dear Santa...I want them all! These are the greatest stamps, and I can't wait to send a special order! What fun!!! Love your projects Mary Dawn, as always! Love your handmade name stamp. The card is very sweet. Just adore your "happy" card, Mary Dawn! And what a sweet "made by" stamp. Thanks for the chance to win one of Britta's great stamps! I just love that you can design your own focal points with these stamps ~ Can't wait to give it a try myself! Yes, I'd order a personalized "created by" stamp too! I love Britta's handwriting on her stamps. Thanks for sharing your card. the card is so cool. would never thought of using those colors. You make the cutest cards! So glad I found your blog. What a pretty card! I love the colors, layering and hearts. Thanks for sharing. Love seeing everyones unique takes on the stamps! Great layering! Cute card. The script is so interesting! I like your card and the font that you chose for your own personal stamp. what great stamps. love the cards! What pretty colors!! How fun! Great cards. I'm a longtime follower of Britta's and I wish her the best in her new venture. I can't wait to order my custom stamp. I don't know how many times I've picked up one of the ready made stamps, only to put it back on the shelf. Now I know why, I was waiting for Britta! I absolutely LOVE the font of your personalised stamp, MD! The card you made is so adorable! I love the personalized stamp!! I love personalized stamps, and Britta's are especially great! I love larger word stamps, and the "happy" stamp is pretty awesome. Good luck to Britta and her new venture. Love your card, and I really like the idea of custom stamps. Thanks for the opportunity to win one! That is a great Happy stamp. Very cool on your lovely card. On to hop......TFS . I love your happy card! That stamp is adorable. I will have to check out their custom stamps. I love new stamp companies! Your card is awesome and Britta is too. Love what you did with your stamp. Love the colors of your card. Your "handmade" stamp makes the project complete. I love personalized stamps and all of these stamps are super cute - thanks so much! Your cards on this blog hop make me happy! You used the happy stamp in such a beautiful way! What a cute card! I do like the happy sentiment. This is a wonderful card. Congratulations on having so much talent. I love all of your cards. Happy is what I am on this blog hop. TFS. Adorable choices! Love the craft card! I love your card! Thank you for sharing. Love the font on those stamps. Great card! Perfect inspiration for the "happy" stamp. 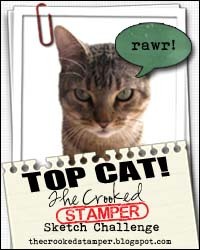 Your personalized stamp is great too! Having a great time hopping along. thanks for sharing. getting great ideas. These stamps make me happy! I like the stamps you picked to use today. I think Britta has a great concept for her company. Thanks for sharing. I love that "happy" stamp...and I love the kraft paper! I love your happy card! Love the font you chose for your stamp. Lovely card too! Love the font you chose for your stamp and the card you created. Fun to explore your blog! Thank you! Such a pretty card. Thank you for sharing great ideas. What a cute personalized stamp, I love your happy card too! I'm a sucker for kraft cards. I love your happy heart card! Wonderful, love the idea of the handwritten name. Like the happy card too. TFS. This hop has certainly opened my eyes to the possibilities of custom stamps. I would love a stamp similar to yours for my cards and projects. Thanks for sharing. Great Happy stamp and your card is so sweet. Best of wishes for this new business! Beautiful card, I love your new stamps! Love the happy stamp and your card. great new products....love your handmade stamp! What a clever idea from Britta! Sweet card! I need a personalized stamp! Such a cute card and awesome give away! I really like your CAS card. What a perfect addition to the back with your personalized "handmade by" stamp. Britta has come up with a great idea to fill a void in the crafting world. You did her proud!! Love your cards; so fun to have found your blog through this hop. I really love the font your name is in! That is adorable!! Never been to your blog, can't wait to have fun looking around!! Love love love it.....thanks for the chance!!! DELIGHTFUL card and SUPER CUTE stamp for the back of your creations Mary Dawn - LOVE the fonts!!! These custom made stamps are SO EXCITING, I've been to Britta's store and the pre-designed ones are FABULOUS too!!! I really like the personalized stamp! Thanks for sharing your stamp idea. I like the way you included your dog. fun stamps! huge congrats to Britta! Love your card and your personalized stamp! Love the "happy" stamp and the card you made with it! What a great card and stamp - thanks for the chance to win. Wonderful card...love the font on the happy stamp. So cute love the handwriting, thanks for a chance to win one. Cute card and stamps. I love the handmade by stamp. Great handmade stamp, it's so nice having a different kind to pick from. Britta's new stamps make my heart happy, too! How fun it is to "tag" the back of your handmade cards. Love that handwritten "happy" ~ perfect for almost every occasion! this new line of stamps makes MY heart happy! they're so fun! A great idea to personalize the cards! Love the idea! So Happy! Thanks for the chance to win. Cute stamps! Love the sentiment and your cute card! Oh my gosh - I love the colors on your card!! So awesome!